So say Phyllis Cole-Dai and Ruby R. Wilson, both members of the South Dakota State Poetry Society, who are celebrating the recent publication of Poetry of Presence: An Anthology of Mindfulness Poems. Cole-Dai, a resident of Brookings, and Wilson, who lives in Bruce, co-edited the anthology for Grayson Books. It was released on September 5th. 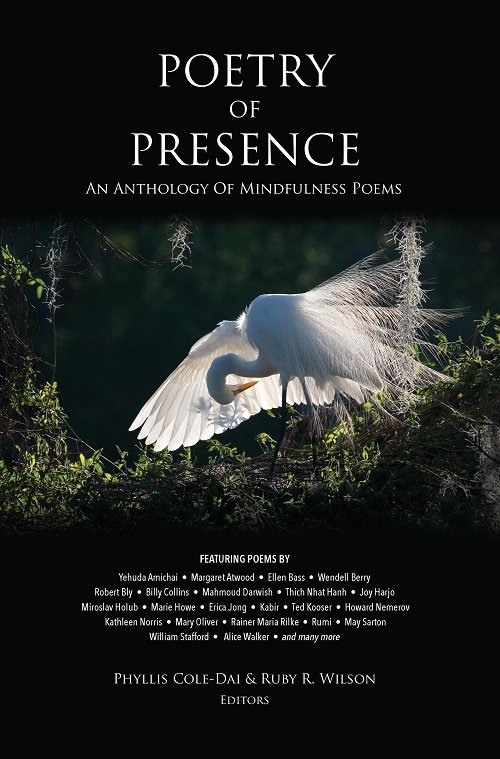 Poetry of Presence is a collection of more than 150 mindfulness poems, mostly by contemporary or recent poets, including Yehuda Amichai, Margaret Atwood, Ellen Bass, Wendell Berry, Robert Bly, Billy Collins, Mahmoud Darwish, Thich Nhat Hanh, Joy Harjo, Tony Hoagland, Miroslav Holub, Marie Howe, Erica Jong, Kabir, Galway Kinnell, Ted Kooser, Howard Nemerov, Kathleen Norris, Mary Oliver, Rainer Maria Rilke, Rumi, May Sarton, William Stafford, David Wagoner, Alice Walker and many more. “We’re also delighted to feature the work of a few South Dakota poets,” Wilson says, citing Linda Hasselstrom, Lydia Whirlwind Soldier and former state poet laureate David Allan Evans. To get a better feel for the book, please visit the book’s website or view the book’s official trailer. Initial sales of the book have been brisk, with orders coming from across the country as well as nations like Dubai, South Africa, New Zealand, Australia, Great Britain and Belgium. The publisher, Grayson Books, will soon do a second printing. One of the significant challenges of creating this anthology was paying the incredibly high cost of permissions to reprint previously published poems. Cole-Dai and Wilson are responsible for covering those fees, not the publisher. With each new printing, they must renegotiate many of the permission licenses and pay additional costs. So while the book is distributed through Ingram and available from all major retailers, they like to encourage customers to buy it through their website. Cole-Dai and Wilson invite you to join them for a “Book Bash” celebrating the publication of their anthology on Saturday, October 21, 3-5pm, at the newly renovated Brookings Arts Council Building, 524 4th Street, Brookings. Enjoy door prizes, delicious food, live music by Green & Snow, readings from the book, and more at this festive open house. To help them prepare for the Bash, please RSVP by October 14th through either Eventbrite or Facebook. If you can’t attend but would like to purchase the book, please either visit the Buy page at the book’s website for details or contact the editors at editors@poetryofpresencebook.com.